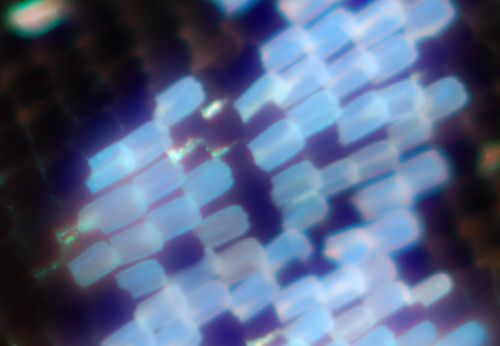 Ok, I've got to grips with the basics of photography through a microscope, now I need to take things to the next level with camera and lenses. My El-Nikkor 1:2.8 arrived yesterday, and my bellows are due to arrive any time now. In the meantime, my dad's given me his old Pentax lenses to play with, and I've spent the morning experimenting with every combination of camera, extension tubes and lens I can think of. The problem: I don't have any reversing rings or any other connectors. Here are some of the results for various combinations. 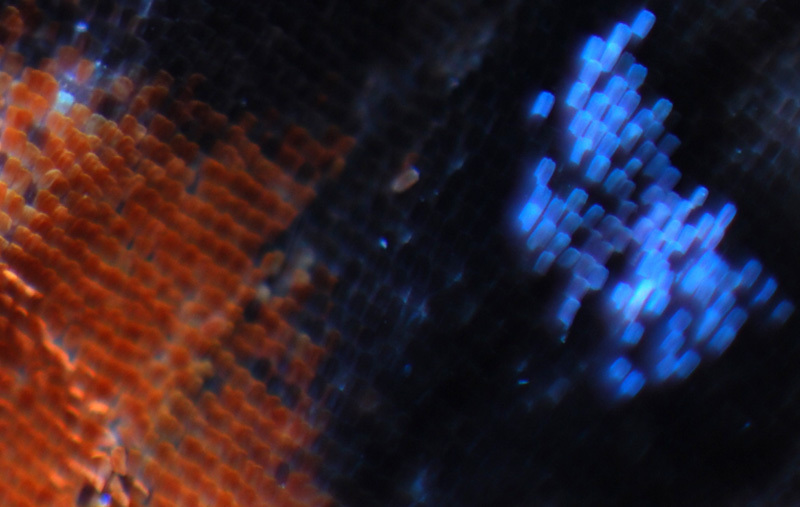 The subject is a very dilapidated Small Tortoiseshell Butterfly wing. So far, I haven't managed to get any decent results with the EL-Nikkor in any of the combinations. The best images so far have come from reversing the Fujinon onto the Macro 90mm. Has anyone got any suggestions as to what other combinations to try, and ideas on why things may not be working in the above setups? You didn't mention what may be the most important aspect of each combination: which lens did you stop down? 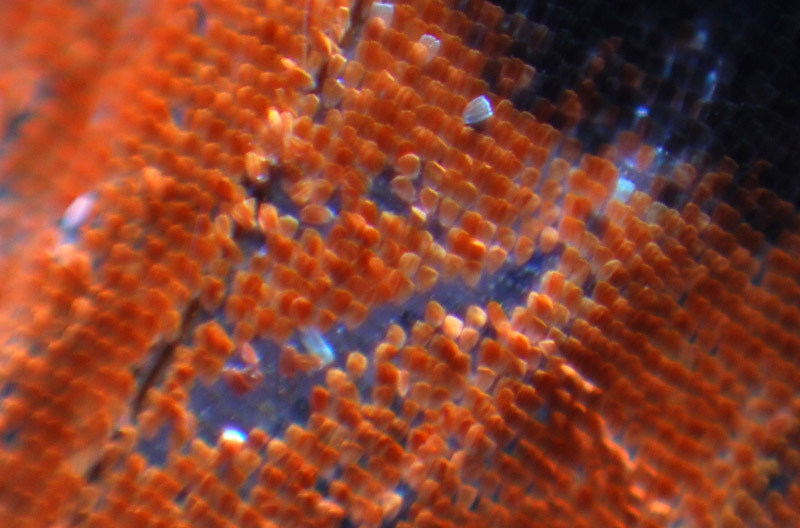 To get the best quality at high magnification, you should be stopping down the front lens. It is usually more convenient to stop down the rear lens, but that practically guarantees that the light rays forming the image have been selected from the worst sections of the front lens. In theory, it shouldn't make much difference smack in the center of the image, but away from center, it can make a huge difference. The very best position to place an aperture (in terms of image quality) is usually between the two lens, but that's also the place of least convenience. Stopping down the front lens is not optimal, but it's more practical. 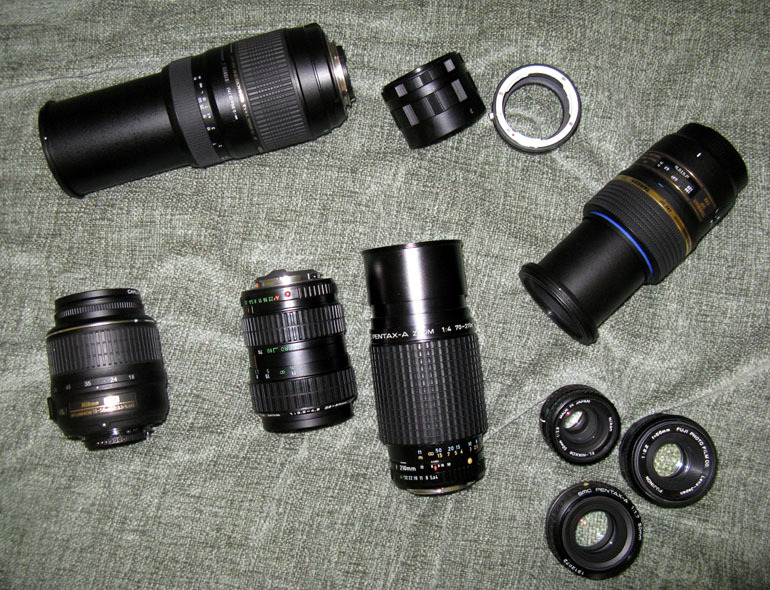 As for other combinations to try, this will sound a bit facetious but since you have the lenses in hand, try 'em all! If that would be too troublesome, try this rule of thumb. For the front lens, avoid zooms. For the rear lens, stop down and look into the front to see where the aperture appears to be. The closer it appears to the front of the lens, the better. Remember also that every one of those front lenses will have an optimum aperture. Usually that's a couple of stops below wide open, but you might have to search for it. Hope this helps, and looking forward to the next report. I have never heard of anyone stacking a 50/2.8 El Nikkor onto another lens. This lens seems to work OK, reversed, all by itself. But of course needs some/a lot of extension. 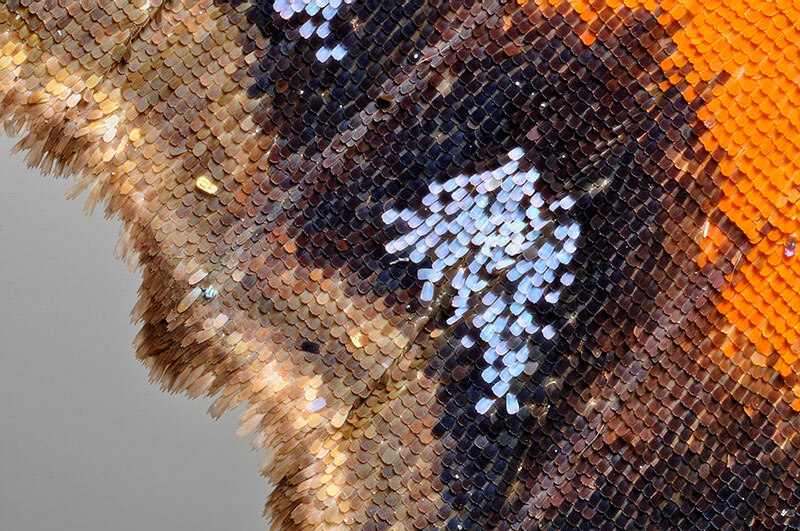 British Small Tortoiseshell butterfly wing scales seem to be a bit smaller than the scales on that moth's thorax. This is what your reversed 50/2.8 El Nikkor @ f/6.7 on 22cm extension should give you with a Small Tortoisehell's wing. Those blue scales really scatter the light. 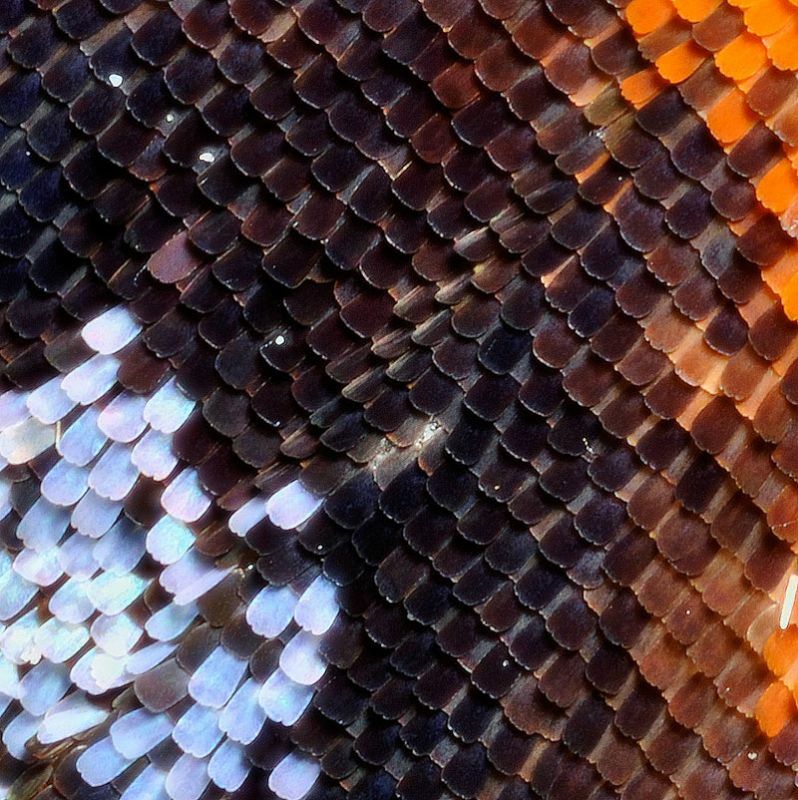 Not the best lens for wing scales. Rik, I had all the lenses on max open aperture. With all my comparative testing, that's the one factor I didn't adjust at all. I'd assumed the more light the better. Ah well, that will keep me busy this morning. I look forward to my bellows arriving so I can give it a go properly. If my final result looks anything like yours I will be VERY happy. 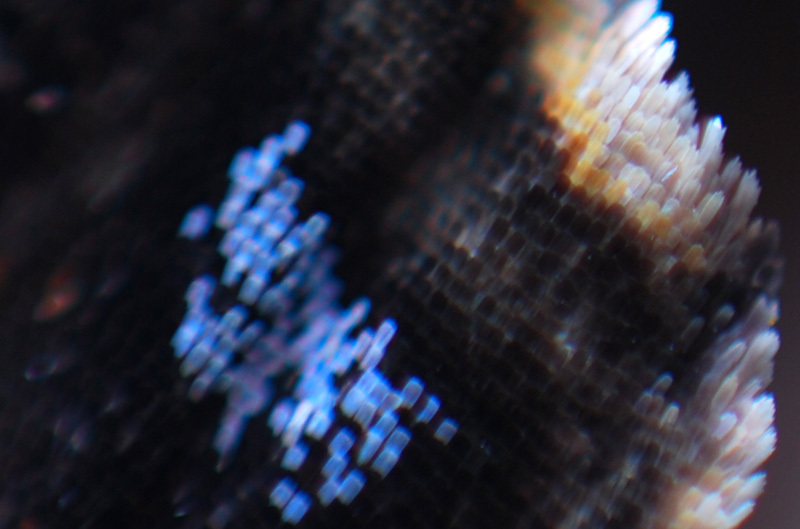 Try using your Tamron 90mm macro, non-reversed, on a bellows or black vinyl pipe. Try different lengths of pipe, say 6" and1 foot. Lovely shot. I'm really glad you mention the Tamron Macro: when it's not on the camera the aperture automatically closes down fully, so I assumed that without the electrical connections of a decent set of extension tubes, it couldn't be used with bellows etc. I've just got the lens out again to check I haven't missed something - I'm hoping to avoid having to use the Embarrassed Emoticon 3 times in one day - but I can't see any way to over-ride this. If there is a way to open up the aperture off-camera I'd be very happy to find out how! I'm glad that NU thought to post that photo from EL Nikkor on bellows. I had assumed that you were playing with lens combos (short reversed in front of long) only because you wanted to get some experience with that until your bellows arrived. 1. Combos are the only way to get high mag macro using a camera with a non-removable lens. Think point-and-shoot, or "DSLR-like" (e.g. Panasonic DMC-FZ50), or a camcorder. 2. Combos gives high mag macro using only stuff that many photographers already have in their bags. 3a. They're relatively durable, compared to bellows. 3b. They provide automatic stop-down at the instant of exposure, if you choose to set aperture using the rear lens. Notice that quality of image is not mentioned in this list. There are a few combos that happen to give top-notch results, but this is a matter of luck and accident since the lenses were not designed to work together. 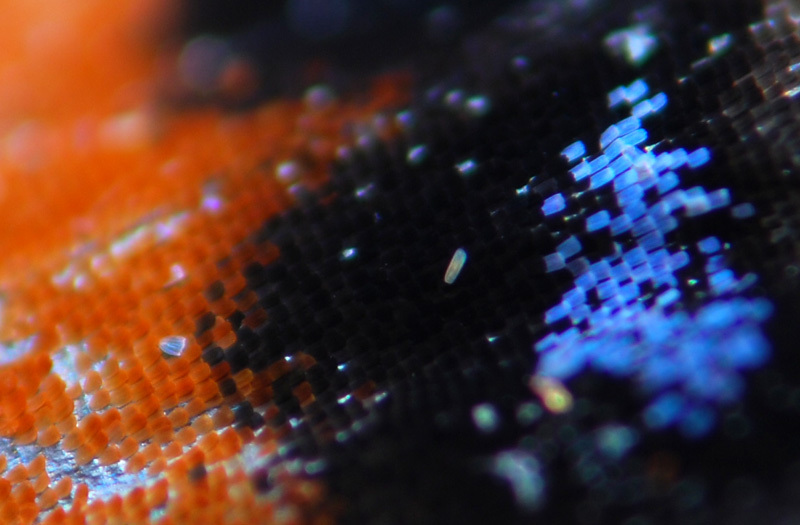 In most cases, the image quality of a combo will be nowhere near what you can get with a good enlarging lens or a designed-for-macro lens reversed by itself on extension. 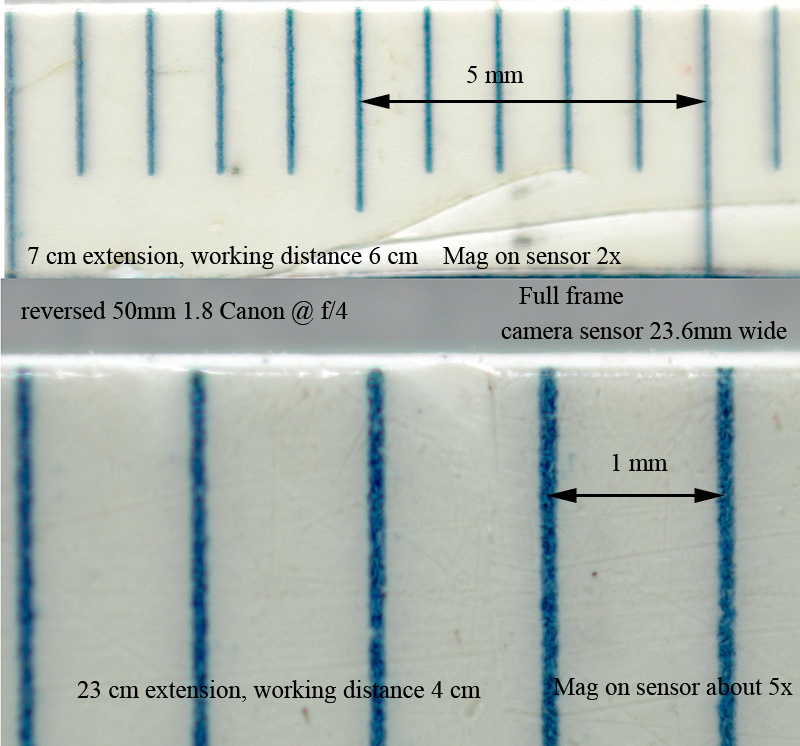 The purpose of reversing a lens, either by itself or as part of a combo, is to minimize aberrations by placing the lens and its two conjugate image planes (e.g., subject and sensor) in the relationship for which the lens was designed. In most cases, that means with the short distance on the mount side of the lens. 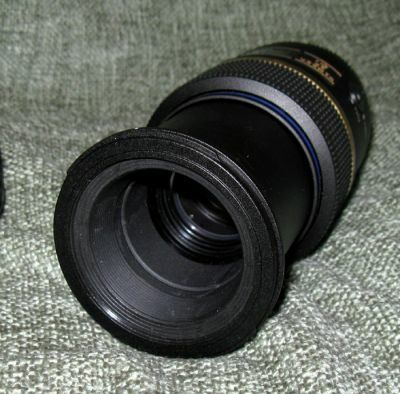 In some cases, notably with microscope objectives and "bellows macro lenses", the lenses were designed to be used non-reversed, with the short distance on the front of the lens; reversing those will degrade the image. I have an old 50mm Canon that I sometimes use reversed on a 105mm and a 200mm. It gives a good/excellent image. So I tried it alone reversed on bellows. These are single frames, quick and dirty using a plastic ruler, to show the potential for your 50mm Pentax. I'm 100% certain that with care this single lens reversed would give excellent images. NU: that's a great demo. Regarding NU's use of the old Canon lens, I have had similar experience with an old Mamiya-Sekor 55 mm f/1.8. Until a few years ago, the Mamiya-Sekor on bellows was my favorite setup. But be very careful to determine what apertures work well. Wide open will probably be awful. Stopping down to f/5.6 or so will make a huge improvement. See HERE, second image, second column. You'll be needing reversing adaptors and the like as well. The far-eastern ones are so much cheaper than camera manufacturer's, it has to be the way to go, but the quality does vary. I had to replace one, because it was too sloppy and thin. A "Roxsen" turned out to be far better, and about the same price. If you obtain one reversing ring for whatever's a common filter thread for your lenses and your camera , say for Nikon, 52mm, you can then get step rings to go from 52 to whatever you need. "There's also a significant shift in focus point over the first couple of f/stops, so it's a bad idea...to focus wide open and then stop down to shoot" That's something that wouldn't have occurred to me. The EL-Nikkor 2.8/50 N has a 40.5 mm filter front thread, so on one side of the reversing ring/adapter you'll need this size as a "male" thread. Don't know about the earlier "non-N" version. Sorry, Chris for my post inbetween, but your "mo" lasted 20 min, so I'd thought you'd got distracted. WHy do I have to keep logging in...? Anyway the El-Nikkor 50/2.8, and 63/2.8 are 40.5mm filter thread. If you use a 52mm reversing adapter, that'll have a 52mm male, so a standard 40.5 to 52 will be right. Ie as if a 52mm filter would go on a 40.5 lens. 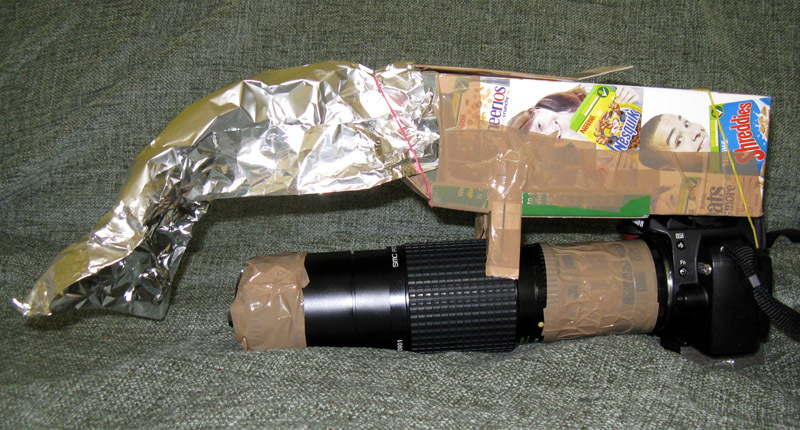 Oh - and use a "lens hood" on what becomes the object side of the lens. Eg a black paper snoot as Rik shows, or a 39mm tube, which is stronger. I'd thought you'd got distracted. You thought right! That's the trouble with this forum!